The tropical plant, Racinaea crispa is a bromelia species with unusual curly leaves in a reddish-brown colour. This exquisite-looking plant thrives in terraria. The Racinaea crispa is a bromelia species with special-looking leaves of a reddish-brown colour and curly-shaped. The leaves grow in the shape of a coronet as is common in bromelia. At the centre of the leaves’core a relatively tre of the plantnative to the tropical forests of Columbia. This plant thrives in a terrarium but also in a living room or office the Racinaea crispa will flourish. 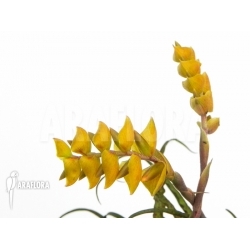 Araflora sells many substrates and ornamental pots for this plant. The exotic plant, Racinaea crispa prefers a light spot but not one in direct sunlight. This species needs a really moist soil. High humidity stimulates the growth of this plant. In a tropical terrarium, e.g. with poisonous frogs this plant appears to full advantage. As substrate a soil without too many nutrients can be used. Araflora produces good results with a mix of peat and potting soil.